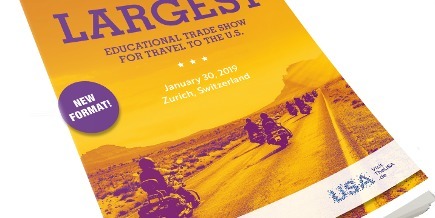 - The on-line USA Knowledge Test will start weeks before the seminar forcing visitiors to study the exhibitor's websites in order to answer the questions. Like in sports, it serves as a "warm-up period"! The test has to be completed in personal contact with the exhibitors at the event per se. The combind number of points (on-line text & seminar) will be used in selecting the participants for the prize raffle at the end of the day. - Marketplace is a professionally built exhibit featuring all partners with individual booths. The newly designed booths will consist in particular of large pictures provided by each exhibitor. The Marketplace serves the purpose of meeting the attendees who have to complete the "Knowledge Test" (above) in personal contact. - Hosted tables Each partner/exhibitor will be hosting a reserved table at lunchtime seating 8-10 visitors. Lunch will be served in two shifts providing hosts with exposure to two groups. - Show act at lunchtime has been abolished to obtain additional time for personal discussions and meetings. For further details please have a look at the enclosed 2019 exhibitors invitation which can be downloaded.